The WarCraft 3 Frozen Throne System Requirements provided by Blizzard detail both the minimum and recommended system requirements required to play the WarCraft 3 expansion. The specifications detailed include information on the operating system requirements, CPU, memory, graphics and more. WarCraft 3 Frozen Throne is more than a dozen years old so it is fairly safe to say that any Windows PC purchased in last 8 years or so will have no trouble running the game. The below requirements are useful if you're using an older Windows XP or earlier PC. Even though the recommended WarCraft III Frozen Throne system requirements are quite low, if you're still unsure of your PC's system specs CanYouRunIt contains the game in their database and you can compare your hardware with the published system requirements. WarCraft III: The Frozen Throne is the only expansion pack released for WarCraft III: Reign of Chaos, the fantasy based real time strategy game and game world that eventually gave birth to World of WarCraft. The game was released in 2003 and added new races, new units for existing WC3 races, four new campaigns, and five new heroes. It also includes new buildings, sea units, and minor gameplay enhancements/upgrades. In addition to the new units, and buildings some of the gameplay changes include a new weapon and armor system with some weapons being more effective different armor than it may have been in the original WarCraft III Reign of Chaos game. Like many real-time strategy games, WarCraft III The Frozen Throne features an economic and military aspect that players must manage and balance between in order to be successful. In addition to the single player campaigns, The Frozen Throne also supports player vs player multiplayer capability that includes a number of different game modes such as free for all, random teams and arranged teams in skirmish matches with up to eight players (4 vs 4). 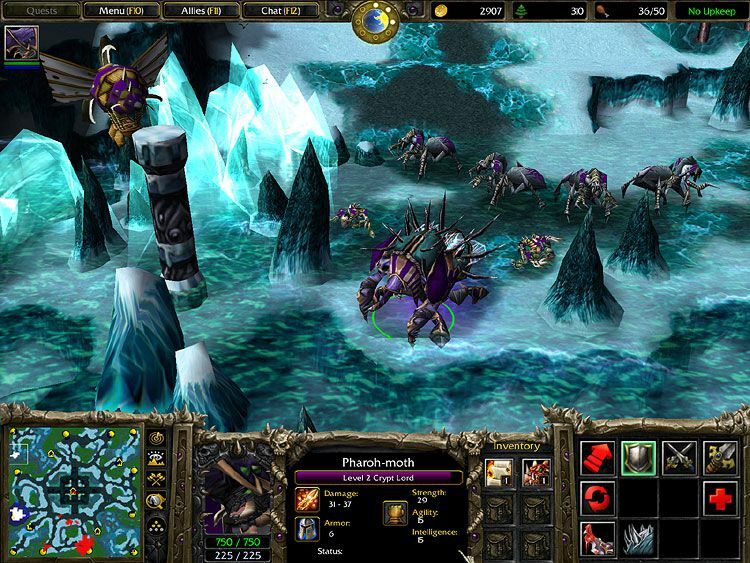 WarCraft III The Frozen Throne also features a complete world editor which allows players to create and share their own games and maps. Some of these custom games have become very popular and their success has generated commercially produced games. These include titles such as Defense of the Ancients (Dota), Island Defense, and various Tower Defense style games.